ERD is a major data modelling tool which can help to organize your project's data into the entities and to define the relashionships between these entities. It is convenient to design ER Diagrams using ConceptDraw DIAGRAM diagramming and vector drawing software extended with the Entity-Relationship Diagram (ERD) Solution from the Software Development Area for ConceptDraw Solution Park. This solution supports Chen's and Crow’s Foot notations that are often used to describe database structure. In a Chen's notation, entities are represented by rectangles with the entities names inside and relationships are represented by diamonds. The attributes are drawn as ovals and are connected with a line to exactly one entity or relationship set. Another type of notation is known as Crow's Foot notation. Fundamentally it is very similar to Chen's notation and differs by designations, are used the boxes to represent entities and the lines between them to represent relationships. The attributes of entity are drawn in the box that represents this entity. The Entity-Relationship Diagram (ERD) solution provides templates and samples that allow you get closer with ER diagrams. All they are available for viewing and editing from ConceptDraw STORE. There are also 2 libraries at the Entity-Relationship Diagram (ERD) solution with all necessary objects to produce your own ER diagram. You can simply drop desired of them into your document to quickly and easily create the diagram. 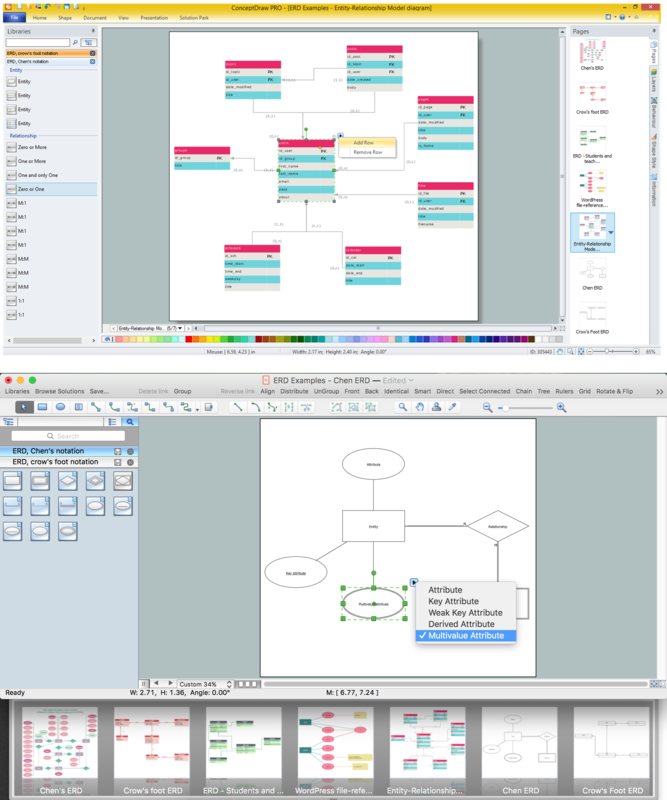 The Entity-Relationship Diagram (ERD) solution for ConceptDraw DIAGRAM helps you to produce the ER Diagrams that you can readily use to document databases in white papers, presentations, data sheets, posters, and technical materials. 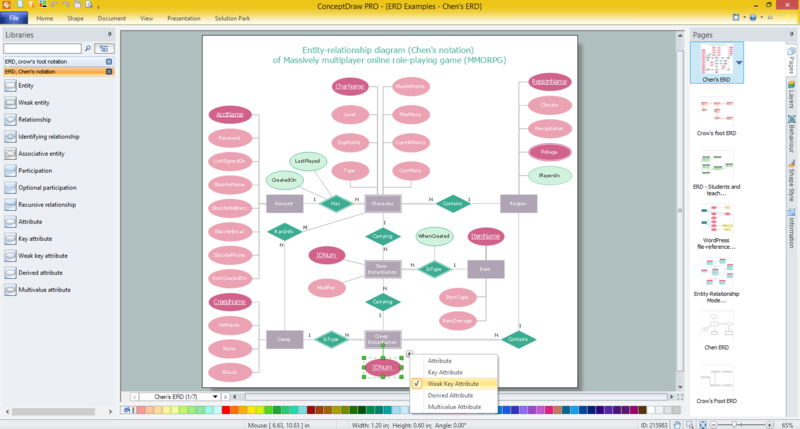 The Entity-Relationship Diagram (ERD) solution from ConceptDraw Solution Park extends ConceptDraw DIAGRAM ector graphics and diagramming software with the ability to describe a database using the Entity-Relationship model and offers a lot of examples that you can successfully use as the base for your own ERDs. Use ConceptDraw DIAGRAM software extended with Entity-Relationship Diagram (ERD) solution to draw your own ER diagrams using Chen's or Crow's foot notations without efforts. Connecting objects manually in ConceptDraw DIAGRAM v12 is a snap: - points; - Connecting groups of objects; - Auto-routing; - Connectors text; - Snap to Guides ; - Quick. The vector stencils library Crow's Foot Notation from the solution Entity-Relationship Diagrams (ERD) contains specific symbols of the Crow's foot notation such as relationship symbols and entity symbols for ConceptDraw DIAGRAM v12 diagramming and vector drawing software. 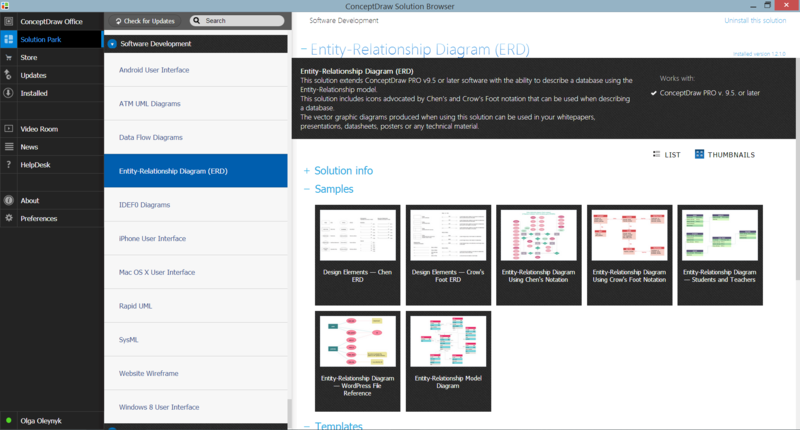 The Entity-Relationship Diagrams (ERD) solution is contained in the Software Development area of ConceptDraw Solution Park. How to design a Bubble Chart? It’s very easy! All that you need is a powerful software. Never before creation of a Bubble Chart wasn’t so easy as now with tools of Bubble Diagrams Solution from the "What is a Diagram" Area for ConceptDraw Solution Park. There are many ways to describe a database structure. One of the most usual is to draw an entity relationship diagram (ERD) using a Crow’s Foot notation to represent database elements. If you don’t want to draw it on paper, you should use an appropriate software. An entity-relationship (ER) diagram is used to show the structure of a business database. ERD represents data as objects (entities) that are connected with standard relationships symbols which Illustrate an association between entities. ERD, there is a wide range of ERD notations used by data bases architects for reflecting the relationships between the data entities. According to the crow’s foot notation relationships are drawn as single labeled lines designating a certain kinds of relationship. Crow foot notation is a most frequently used ERD standard, because of improved readability of diagrams, with a more accurate use of space on the page. It is very difficult to get into database model idea without any examples. To create one, you can use Chen’s notation for Entity Relationship Diagrams (ERD) and try to see all the peculiarities yourself. This notation describes entities and relations as basic geometric shapes like rectangles and diamonds. Chen notation for Entity-relationship diagrams is used for designing relational databases. It depicts the database entities as a set of subjects. For example events, people, ideas, etc. All entities has common characteristics (attributes). Any object of the system is identified as the sole and unique. The name of entity should indicate the class or type of the the whole object, not a given example. The connection commonly represents a relationship between entities. Conceptdraw Entity-Relationship Diagrams (ERD) solution provides the libraries with ready-to-use ERD element fitting Chen's notation objects and relationships. While designing a conceptual data model, you should use appropriate software. For instance, ConceptDraw DIAGRAM v12 is a user-friendly ER diagram tool that has a lot of samples and templates to facilitate your work. A clear entity-relationship diagram helps to define the relations between system’s components. Software engineering is the section of a computer science engaged to design, realization, and support of complex software products. An ERD is a data modeling method that is widely applied in the software engineering practice. Commonly it is used for developing a structure of a a relational database. 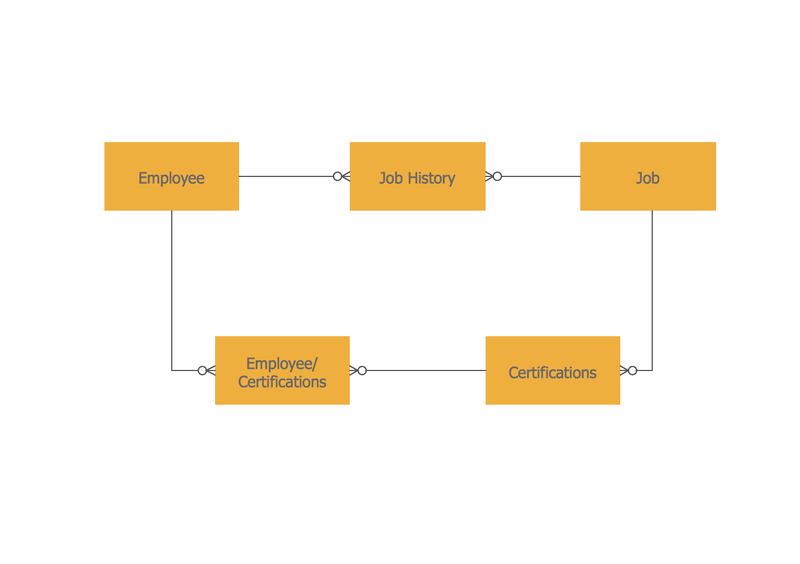 An entity relationship diagram is helpful for structuring and organizing databases that can be modeled using a relational structure. 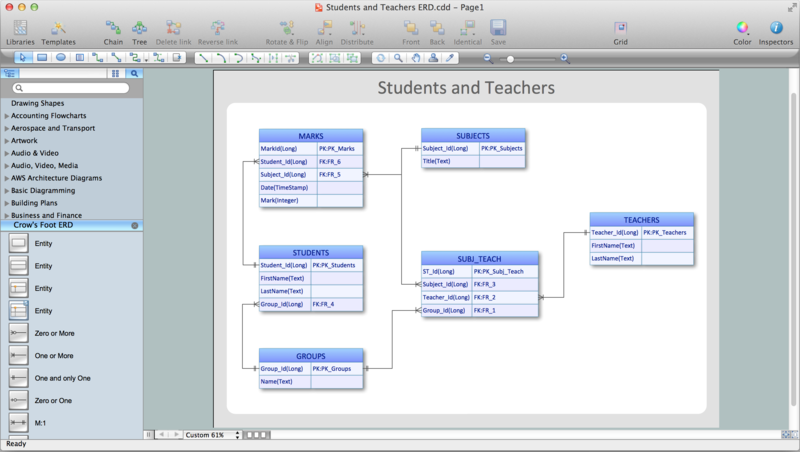 An entity relationship diagram is designed to depicts the interrelationships within the sets of entities which are accumulated in the database. Each entity represents a particular component of a data. Thus, ER diagrams depicts the logical structure of databases. ConceptDraw ER Diagrams solution provides software engineers with the professional tool for making entity-relationship diagrams.